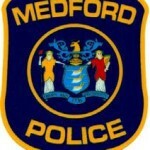 Medford Township Police responded to the CVS at Route 70 and Hartford Road for a report of a robbery. At approximately 4:30 p.m., a white male subject entered the CVS and walked to the pharmacy counter. The subject handed a note to the employee indicating he had a gun and wanted all the cash from the register drawer. The employee handed the subject an undisclosed amount of cash and he subsequently left the business. A bystander observing this subject leaving the business provided additional investigative details and was able to describe the vehicle the subject left in. A general police broadcast was announced and officers from Evesham Township located the vehicle on Route 70 in the area of Cropwell Lane. The subject in the vehicle was identified. Based upon witness statements and video surveillance, he was arrested without incident. The proceeds were recovered and he was charged with robbery, terroristic threats and theft. During the investigation, police determined that although he indicated he had a gun, none was used during the commission of the crime. He was lodged in Burlington County Jail in lieu of $150,000.00 full cash bail.